Nobody wants to get pulled over when they’re driving down the highway, but as radar technology gets more sophisticated, it becomes more difficult to avoid the highway patrol. 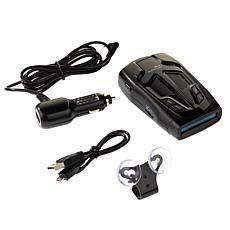 Savvy drivers who are looking to stay alert and stay safe on the roadways turn to the very best in high-quality radar detectors before they take any road trip. HSN is here to provide a complete range of laser detectors to let you catch the police before the police catch you. Choosing the right laser radar detector is an important decision, and there are a lot of factors to consider. Laser radar detectors use the best available technology to scan not only for radar signals, but laser beams for those speed traps that use more advanced methods other radar detectors might not pick up. Shop HSN today for radar and laser detection units that provide security and peace of mind, and even have real time voice alerts so you’ll be sure never to miss a warning when it crops up. Don’t go on a road trip without your laser detector, and while you’re at it, check out our units that include GPS functionality!